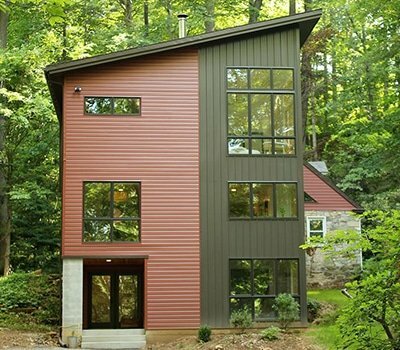 The marriage a stone and timber home with a passive solar modern addition nestled in a hillside surrounded by a lush forest and stream. This passive solar home takes advantage of the below grade stone foundation to draw the cool air and create a chimney effect for natural cool summer days. The winter warmth is drawn from the Eastern and southern exposed high glazing when the leaves are down and the sun passes thru.